Cranberry Pistachio White Chocolate Truffles are super cute and festive no-bake dessert! They look like little snowballs and when you take a bite, you’ll realize it’s seriously tasty stuff!!! This is the tastiest Christmas dessert recipe ever!!! However, you must add this Cranberry Pistachio White Chocolate Truffles to your holiday party menu! And white chocolate speckled with pieces of bright red cranberries and green pistachio make these yummy little balls really cheerful. 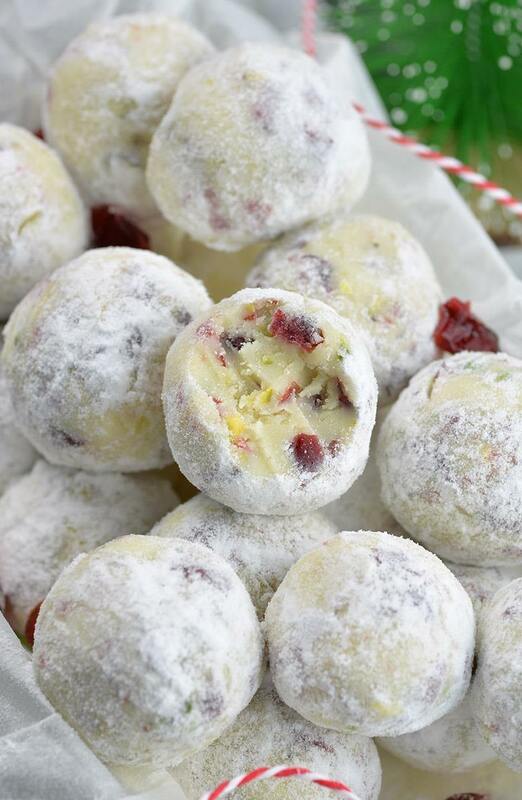 Moreover, these Cranberry Pistachio White Chocolate Truffles are rolled into powdered sugar what makes them look super festive, like cute snowballs. What could you want more of a Christmas dessert?! 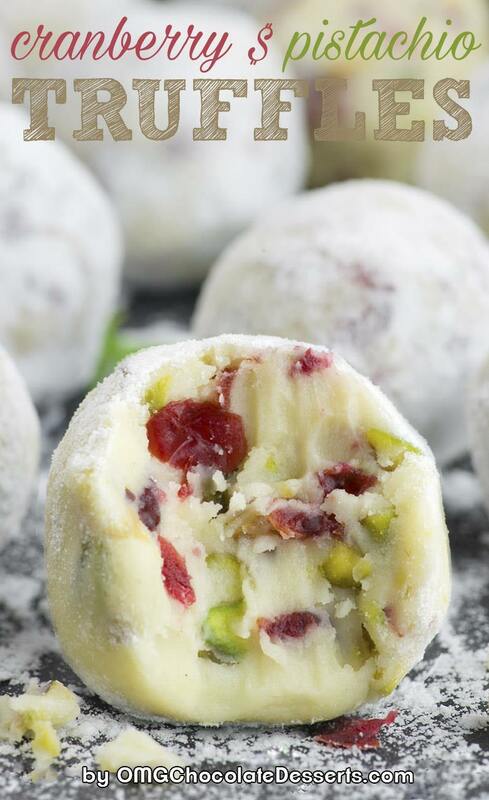 But Cranberry Pistachio White Chocolate Truffles are not just pretty looking treat, they are incredibly tasty! Tart cranberries cut out the sweetness of white chocolate and pistachio makes them really decadent and rich. And that is perfect combination of flavors! finally, white, red and green colors simply scream Christmas. Here is one good reason why you should try this Cranberry Pistachio White Chocolate Truffles if you are looking for delish recipe to make for holiday. This is really simple no bake recipe and you could make it in advance and store in the fridge for a week or freeze it for longer storage. however, I look forward to Christmas, but we all know how stressful it could be around Holidays. Don’t get me wrong, I love holidays! Holidays are great! Families gather at home to spend precious moments together and make unforgettable memories. But you have to put a lot of work to cook and bake for your loving family and friends. Plus decorating a house, a lot of shopping and wrapping gifts need to be done…! And I don’t want to sound dramatic, but the key is in a good organization and planning in advance. When you already know that you’ll be short on time just before holiday, good news is that some work can be done in advance. That’s what’s great about this recipe! 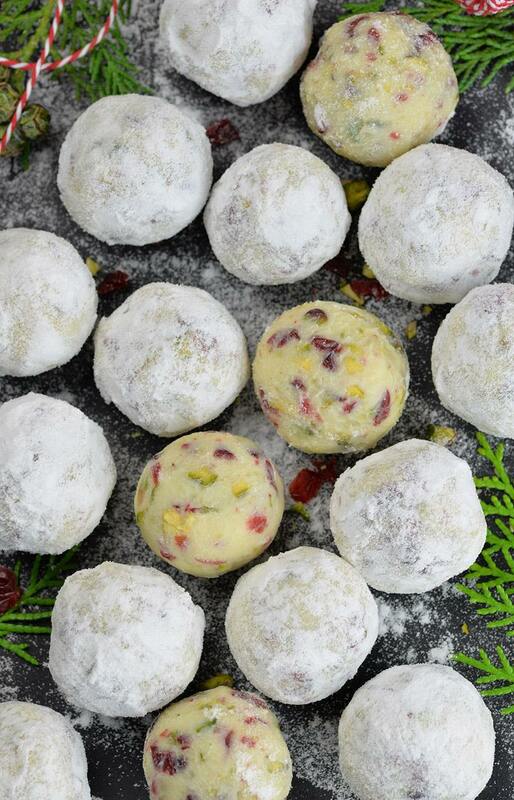 These Cranberry Pistachio White Chocolate Truffles will look great at your Christmas tray. And even if you don’t want to freeze them, they really don’t require a lot of active time. Just chop some cranberries and pistachio, melt white chocolate, butter and heavy cream, stir all together and place in the fridge for a few hours. While you are waiting the mixture to firm you could complete some other tasks. At the end, roll the mixture into small balls, coat with powdered sugar and your Christmas delight is ready for party. You could take these cute and tasty Cranberry Pistachio White Chocolate Truffles to cookie exchange or pack them and make great homemade gift for a friends. I love cranberry recipes and when Christmas season starts, I simply crave cranberry EVERYTHING! It’s maybe because of their bright red color what makes very dessert look so cheerful and festive. Cranberry desserts are also very delicious. I suggest you to try my White Chocolate Cranberry Pound Cake, too. It’s still one of the most popular recipe on my blog after a couple of years. And if you share my love for cranberries, please check these awesome White chocolate Cranberry Cookies that opened my Christmas desserts series this year! If you need more great White Chocolate Truffle recipes look at those Lemon, Orange Creamsicle or even Blueberry truffles. They are all made of the same base, three simple ingredients: melted white chocolate, heavy cream and butter. You could easily adapt them to your taste, the possibility are endless! These Cranberry Pistachio White Chocolate Truffles are super cute and festive no-bake dessert! First, in a small sauce pan over low-medium heat melt butter, add heavy cream and stir just to combine. Then stir in salt (and orange or vanilla extract if desired) and set aside. Remove from heat and using a rubber spatula gently stir in lukewarm mixture of butter and heavy cream into melted chocolate. NOTES!! !Butter and heavy cream mixture should be approximately the same temperature as melted chocolate when you combine them. finally, stir in chopped cranberries and pistachio and let it sit at room temperature for an hour, cover with a plastic wrap pressed on the top of the mixture so a film does not form. Then refrigerate for 2-3 hours (until firm). When the mixture is firmed, using a small spoon or a melon baler scoop out the mixture and roll into an inch balls. It might stick to your hands so clean your hands with a paper towel after rolling each ball. Finally, roll each truffle into powdered sugar to coat them well. Are the cranberries with, or without sugar? Like Craisins? You can use what ever you prefer. Truffles will be sweet enough from white chocolate and powdered sugar even if you use cranberries without sugar, but if you like sweeter desserts use Craisins. I prefer cranberries without sugar to cut down the sweetness, but it’s up to your taste. It makes more than 20 truffles. I know it would change the look, but could you use dark chocolate? I am truly not a fan of white chocolate. Hi Becky, I haven’t tried but I think it will work just fine. How do you get the white chocolate mixture to actually incorporate into the butter mixture. I followed the directions exactly, i.e. keeping the temperature of moth mixtures about the same, but they will not mix together. The white chocolate mixture is swimming in melted butter. Hi Pamela,I’m sorry, I don’t know what went wrong, try to reheat the mixture over a double broiler stirring gently. Pamela, We have attempted this twice with the same result!! 🙁 VERY upsetting!! Drain off melted butter, warm some semi skimmed milk and add gradually whilst mixing and it will come back together. You won’t need much milk just a few teaspoons. I did this after mine split and was fine. Thank you for this tip. My mixture separated as well but I drained off the butter and added roughly a tablespoon of warmed whole milk and it came right back together. Now I’m just hoping that it firms up without any issues! I had the same problem on my first attempt. My thought is chocolate got too hot and seized up when adding lukewarm liquid resulting in butter not incorporating. Second attempt I tempered my chocolate using microwave instead of double boiler with much better results! I microwaved it about 1 minute in mine, just until I could see it starting to melt on the bottom. Then just stirred until it was completely melted. Made these today’ they turned out great But blueberry one had lots of problems . Found out it was temp where I made my mistake . Why does my butter keep separating out at the end? The rest of everything underneath is fine, but a whole bunch of butter floats to the top. This is the second time I’ve made this recipe with the same result, and I don’t see anything about this in your notes above. Any guesses? I cannot get the mixture thick enough to roll into balls. Even after freezing the mixture for 2 hours! As soo as I begin to scoop the mixture it melts right in my hands. There is no way this can be rolled into balls! How could I thicken the mixture? I really think there is a typo in the recipe. 5 tablespoons of butter made this a greasy mess! The mixture did eventually incorporate as it began to firm up, but all you can taste in these truffles is the butter. Maybe I can save it by using it as a pancake or french toast spread. Wow! A so delicious recipe! I’ll try it in the next coming days for sure! I made these truffles as well, following the instructions and temperature carefully. I too had pools of melted butter when I tried to mix the chocolate and butter/cream mixture. I tried to stir it over my double boiler as suggested, but that didn’t help. So I decided to add some sweetened condensed milk to try and save the recipe and I now have beautiful truffles! For those having problems, I added 1/3 to 1/2 sweetened condensed milk to the mixture over the double boiler, stirred slowly and it came together nicely. I chilled as instructed and the truffles rolled fine, though are still fairly soft. I hope this helps someone! as it is not so much of a white chocolate taste. What type of dish/pan are they cooled in? I don’t know what I’ve done, but I’m at having combined all ingredients and it looks curd led and the butter will not mix in. It’s separating more the longer it sits. I’m sure that neither the butter cream mix nor the chocolate were too hot. Help! The yield for this please? 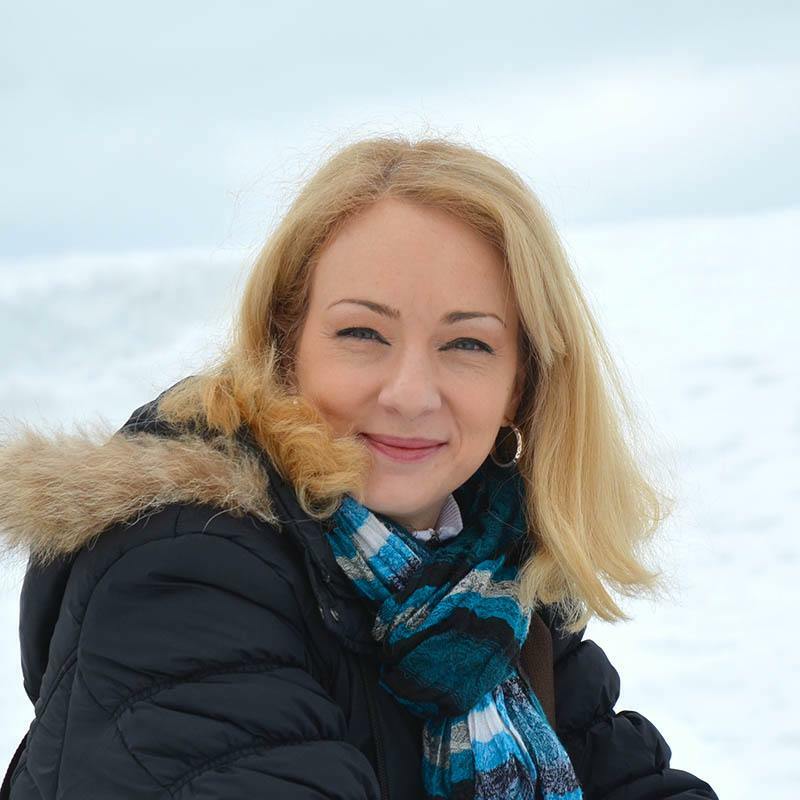 Hi Dasuni, this recipe makes more than 20 truffles. Hi! Would like to try these tomorrow. Just wondering, from the comments, if there is anything I should differently? Also, do you toast the pistachios first? Hi Kim,I used toasted pistachios. Do you use roasted salted or unsalted pistachios? Hi Tina, you can use sated pistachio if you like sweet and salty combo. Just thinking after reading all the negative comments that maybe you could rethink the recipe instead of all the readers trying to salvage it for each other. Looks like everyone had a problem. Like others, there was a lot of butter that seemed to separate, so I just added powdered sugar until the butter seemed absorbed. It took about a cup of powdered sugar. After letting the mixture reach room temp, I rolled into balls. I ended up with two dozen. I took them to a cookie/confection exchange, and guests liked them. I’ll make them again, and plan on adding powdered sugar.